I loved Slumdog Millionaire...when I watched with my wife, sister, and brother-in-law I think the final consensus was similar in that regard. It's the type of film where you are glued to the story and want to avoid leaving the theater for a bathroom break at all cost. At the same time, the story's seemingly-whimsical premise of a boy who is on the Indian version of Who Wants to Be A Millionaire carries some light weight moments, generally this film is relatively heavy and my wife and sister consistently felt like overall the move was sad or depressing. 9. Consistent Characterization by Multiple Actors. The three main characters Salim, Jamal, and Latika are each played by three actors, and I thought each of these nine actors under the direction of Danny Boyle's really did an exception job of capturing the essence of these characters so that the transition from one actor to the next is seamless and believable. 8. Ayush Mahesh Khedekar & Freida Pinto. If this film receives any acting award-attention it will come to the lead-actor Dev Patel who plays the main actor...the oldest of characters to play Jamal Malick. That award attention may come in a supporting form. But if I were to draw out two performers who I would want to see in more films, it would be the youngest Jamal played by Ayush Mahest Khedekar and Freida Pinto, the oldest incarnation of Latika, who really seems to have some potential to be a diverse new face in cinema. 7. Cultural/Social Issues. Slumdog Millionaire is able to touch on multiple cultural and social issues relevant to India's modern history. The story dealt with issues like the mutilation of children for the purpose of begging, religious intolerance, poverty, organized violence, and India's modern economic development. 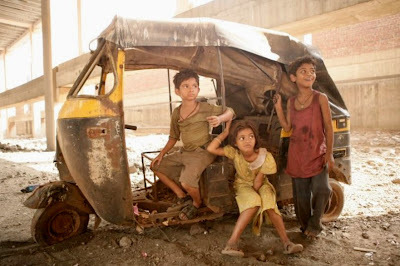 Slumdog Millionaire deals with these issues without being a overt message film. 6. New Ideas. Some people like to say that there are no new ideas. Truly, this film is unique. If I had to create what it's a hybrid of, I would probably have to say City of God mixed with the documentary Born into Brothels...and that hybrid doesn't begin to touch on the fact that the story is told around the Indian version of Who Wants to be a Millionaire. 5. A. R. Rahman's Music. In many ways it seems that the 42 year-old Oxford scholar Allah Rakha Rahman has greatly influenced the music of Tamil and Hindi language films in India. With over 100 film scores to his credit, his westernization of Indian-cinema now has the reverse effect as he does a powerful and moving score to accompany this film, allowing his Indian-style to impact Western-cinema. 4. The Credits. Speaking of A.R. Rahman's music, the final credits with the song "Jai Ho" is incredible and really ties in some Bollywood influence with the dance scene and the great song. It helps you leave the theater with an excited feeling about the experience you just had. 3. Quality before Pedigree. I have to believe when Danny Boyle and the production team behind this film where putting together the cast and crew they were far more concerned with getting the film right then they were concerned with soliciting Oscars,critical awards, or even a massive box office take. This film seems to genuine, and it's lack of massive headline names in the cast and crew really seems to show they were concerned with the right casting choices for this project, not just award-love. 2. The Cinematography & Editing. This film is shot beautifully. The shots are so diverse...the editing of these shots is explosive, and the color, angles, and excitement created by these lens and editing is powerful and makes this film an artful done film that's incredible to watch. 1. Unforgettable Experience. This film is nothing short of a unique experience. No one who watches this film will ever forget it or get confused about whether or not they've seen it. It's a unique film that people will want to talk about, that they'll remember, and I believe will hold a special place in cinema. I like your reason for no 6,all we need just an idea. Reading this made me like the film more than I did. Thanks! I agree with most of what you said. Slumdog is definitely the pick of what I have seen this year post Feb.
RC, I just saw this today & (as usual) completely agree with you. What a fabulous movie! We just got back and we both loved it. I agree with all ten of your reasons. Thanks for putting into words what I could not about this incredible film.